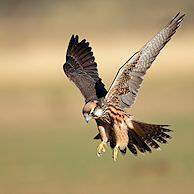 African Sky conducts quality private overland safaris in South Africa and Namibia and offers fly in safari packages to Botswana, Zambia and Mozambique. Book your African safari vacation for 2019 or 2020 with an experienced company. 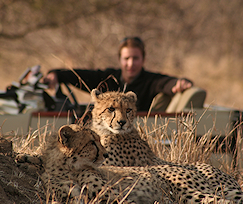 South Africa boasts an extraordinary variety of safari experiences, from national parks to private game reserves. 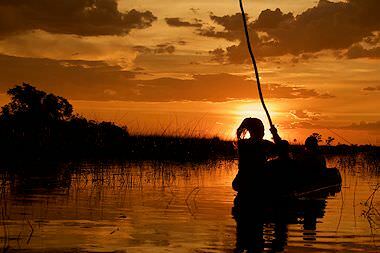 The Okavango Delta, Chobe, Linyanti and Savute offer unique water-based safari activities. Sossusvlei and Etosha provide unique safari experiences unavailable elsewhere on the continent. 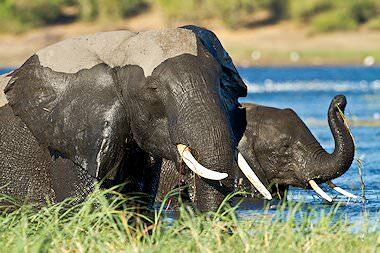 Visit the Victoria Falls or go on safari in Kafue, Lower Zambezi or South Luangwa. Along with the wonder of Vic Falls, Zimbabwe's safari areas are wonderfully remote and authentic. Explore the wondrous underwater world of the Indian Ocean on safari in Mozambique. Let us match your specific needs to the appropriate wilderness area or lodge for a customized African safari experience. The African safaris below offer the finest combination of remote wilderness areas, fantastic lodgings, expert guiding and, above all, rewarding game viewing. A range of budgets and interests are catered for. 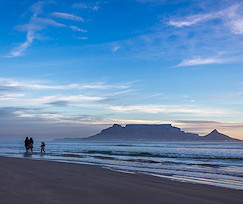 Explore South Africa's top Big Five-hosting national parks along with your own personal African Sky guide. 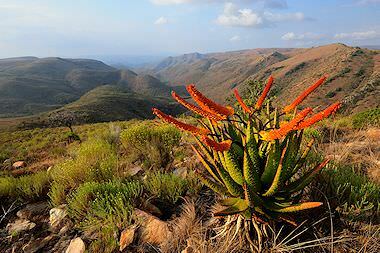 This safari includes Kruger National Park, Hluhluwe-iMfolozi, Addo and Pilanesberg. An unforgettable privately guided overland adventure in Namibia which combines seaside Swakopmund, the ancient art of Twyfelfontein and the incomparable wilderness of Etosha National Park. This safari couples two of South Africa's premier Big Five safari destinations - Kruger Park and Hluhluwe-iMfolozi. Your experience will be enhanced your private guide. Experience Southern Namibia's highlights on an unforgettable privately guided overland safari that visits the Fish River Canyon, the Aus and Luderitz area and finally the captivating Sossusvlei. Three distinct areas of the two million-hectare Kruger National Park are explored on this week-long getaway to South Africa's most sought-after safari destination. Your adventure is privately guided throughout. A shorter - but nevertheless unforgettable - adventure in Kruger, where your days are spent enjoying as many privately guided game drives as you wish. 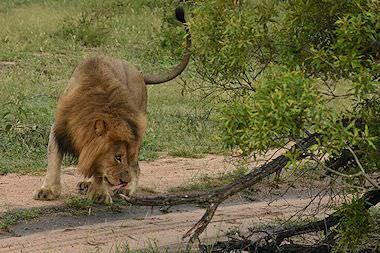 The Kruger Park is synonymous with African safaris. Our most comprehensive African safari visits four different countries, three entirely different safari areas and bucket-list destinations like Cape Town and the Victoria Falls. 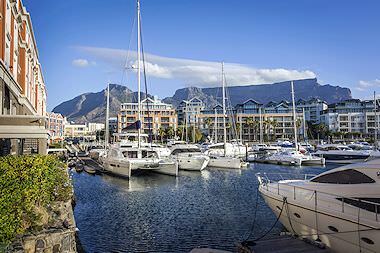 This ultra-luxurious safari and tour combination explores the finest wilderness areas in each country before ending off in South Africa's beautiful Mother City of Cape Town. An overland safari adventure that travels across northern South Africa into Botswana through some of these country's wildest areas. 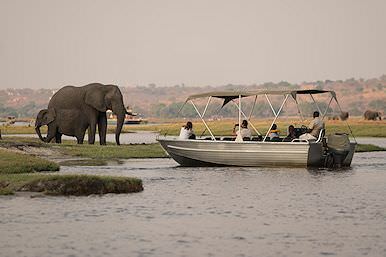 The Chobe safari is the cherry on the cake. 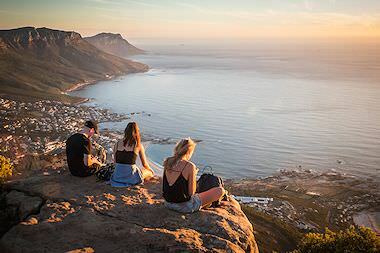 An affordable four star safari and tour combination that ticks off three fabulous bucket list destinations - Cape Town, the Kruger National Park and the awe-inspiring Victoria Falls. 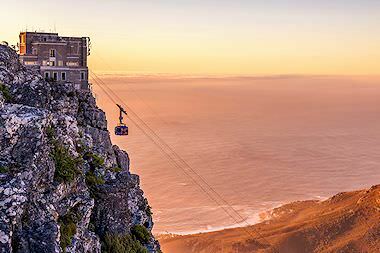 Experience South Africa's two premier destinations while relishing each area's most plush accommodations. 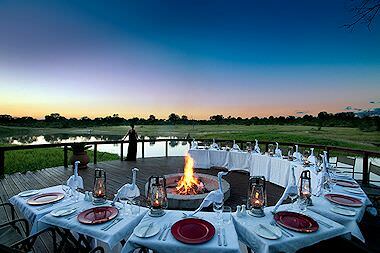 No luxury is spared on this exclusive top-end African safari. Savor the best of both worlds when you combine a privately guided overland Kruger Park safari with some time spent at a luxury safari lodge for a more comprehensive experience. The most memorable and rewarding two weeks. You'll stay at all the most sought-after safari lodges in Botswana, gaze upon the Victoria Falls and relish a safari in the Sabi Sand. This African safari's name says it all - "the finest'. Savor wild and wonderful Botswana's most enchanting safari areas and lodges before having your breath taken away at Victoria Falls. Three unique Southern African countries, four awe-inspiring safari areas - the Greater Kruger's Sabi Sand, Matetsi in Zimbabwe and Chobe and the Okavango Delta in Botswana. 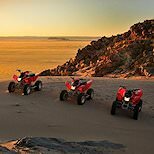 Make your way across the vast Namib Desert on a nine-day adventure that visits Windhoek, Swakopmund, Sossusvlei and Etosha - all Namibia's most sought-after destinations. One of our most exclusive African safaris, the Kruger's Finest Fly-In couples South Africa's premier safari lodges - Rattray's on Mala Mala and Lion Sands Ivory Lodge - in one opulent package. 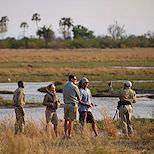 We offer safari packages to the top wilderness areas in Southern Africa. 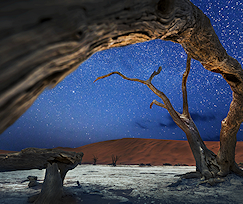 These destinations offer bewitching landscapes, as bare and breathtaking as the Namibia's desolate dune sea and as lush and ample as the drenched drama of the Okavango Delta. Wherever you choose to roam, with African Sky, it is sure to be magical. 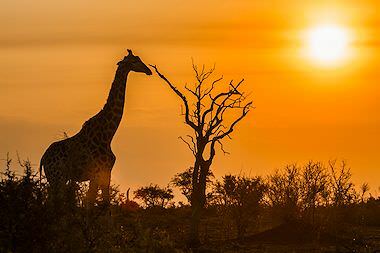 South Africa's world-renowned Kruger National Park is such a popular safari destination that we dedicate a whole host of safari packages solely to its wild wonders. 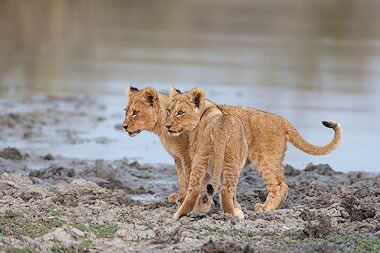 Sabi Sand Private Game Reserve features in a wealth of our packages, from Greater Kruger Park safaris to longer safaris that combine Africa's premier conservation areas. 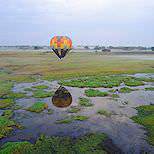 Okavango Delta safaris are exclusive fly-in experiences, and are often combined with other Botswana destinations. It is one of the most storied safari areas in the world. 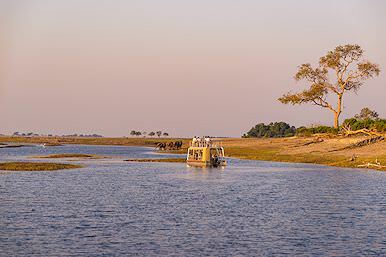 One of Botswana's largest national parks, Chobe National Park can be conveniently accessed via the nearby town of Kasane or even Victoria Falls in Zambia or Zimbabwe. 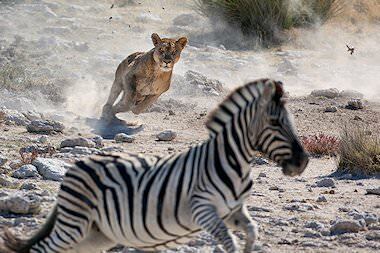 Etosha National Park is included in both our private overland and luxury fly-in safaris that visit Namibia. This arid wilderness area is truly unique and flush with wildlife. Victoria Falls is one of the most popular safari destinations on the continent, and with good reason. 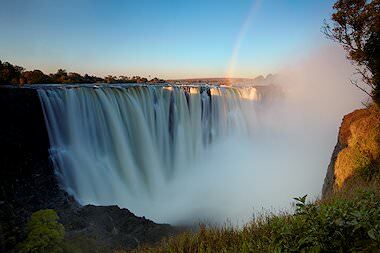 The Falls feature in a wide variety of our safaris. Experience the beauty of Africa through the lens. This featured film highlights the terrain, wildlife as well as accommodation options on offer while on a safari vacation to the African continent. 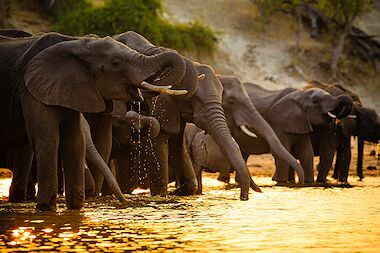 The Big Five arguably inspire the most awe amongst Africa's myriad wildlife, but there is so much more to encounter. Meet thousands of Cape fur seals at Cape Cross, marvel at choruses of birds across the continent, spy the hippos and crocodiles of Africa's waterways, get up close with the formidable great white shark, walk side by side with the world's fastest land mammal, and wonder at this corner of the world that has been blessed in abundance. Why book an African Safari Package? "African Sky provided an individually tailored safari experience with great flexibility in response to our energy levels and what the animals were doing. They provided an effective response to initial e-mail enquiries and a professional level of detail, which is why we booked with them. Mary-Anne is a gem." African safari activities are designed to maximize not only game viewing, but your immersion into the wilderness. 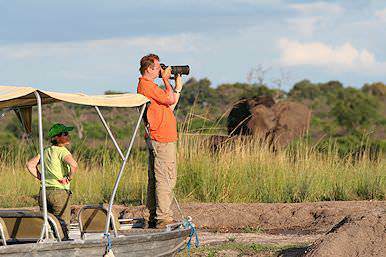 This is why many safari lodges and camps offer more than just your standard game drive. However, regardless of the variety of activities available, quality should always supersede quantity. Though the Big Five certainly reign supreme and offer exhilarating encounters, the safari experience has much more to offer the avid nature enthusiast. The variety of activities is thus more about diversifying your experience rather than increasing the number of sightings on your list. 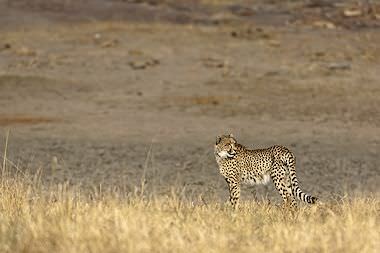 An open 4x4 game drive serves as the quintessential African safari experience. 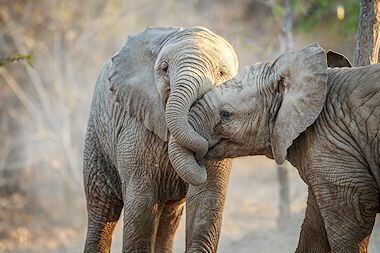 This activity has its origins in the early days of the Kruger National Park, when the first visitors to the park would view wildlife from the comfort of a steam train. 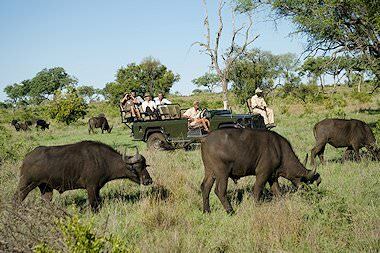 Today, your game drives are conducted from the back of open-air 4x4 safari vehicles or closed air-conditioned vehicles. These excursions typically take place in the early morning hours or late afternoon, when the animals are at their most active. Of all the countries we offer safaris to, Botswana is certainly most notable for its many opportunities for water-based game viewing. 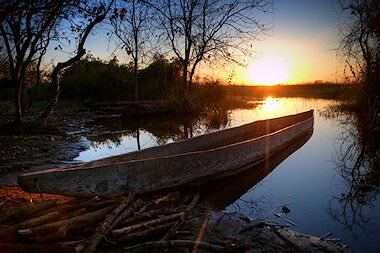 In fact, select camps in the Okavango Delta offer exclusively water-based safaris in traditional mokoro canoes (or fiberglass replicas). Gliding quietly along the emerald waterways of the delta is simultaneously tranquil and thrilling. Guests are always accompanied by experienced guides to ensure their safety. When enjoying a safari in Africa, there is no better way to dig your heels into nature than pursuing a tracker and guide into the bush. 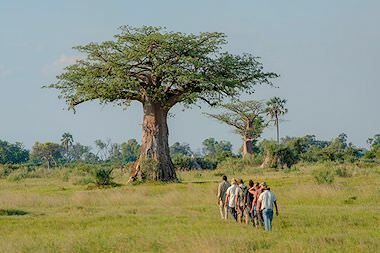 With only the experienced knowledge of an armed ranger between you and the thrilling perils of the wild, a bush walk can prove both an exciting and relaxing part of your safari holiday. 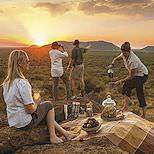 Bush walks are typically conducted in the early morning or afternoon with groups of up to 8 people. 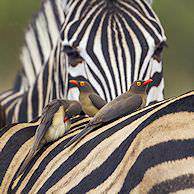 Southern Africa is truly a birder's paradise. 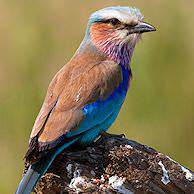 The Kruger National Park alone is home to around 500 species of birds, including migrants and vagrants. 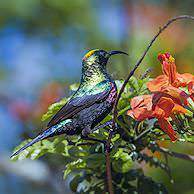 South Africa totals more than 829 species - the most in Southern Africa - while Zambia comes in second at 770. 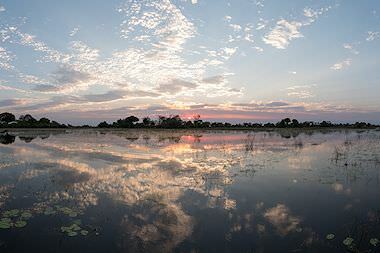 Botswana, surprisingly, hosts the least, but its unique landscapes like the Makgadikgadi Pans and the Okavango Delta draw magical proliferations of waterbirds in the wet season. 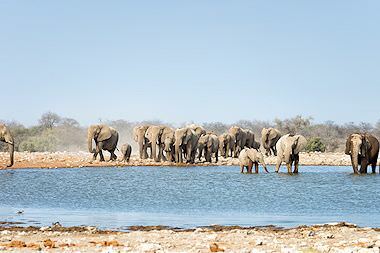 In addition to game viewing, there are a handful of other unique avenues to connect to the wilderness around you. This could take the form of interacting with wildlife, making intimate discoveries, an exhilarating adrenalin rush or passive immersion in an awe-inspiring setting. 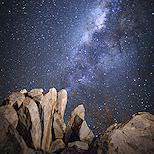 The luminescence of the night sky is most brilliant above the remote wildernesses of Africa. 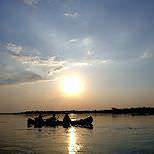 The prolific Zambezi River in Zambia and Zimbabwe is one of the finest tiger fishing destinations on the continent. 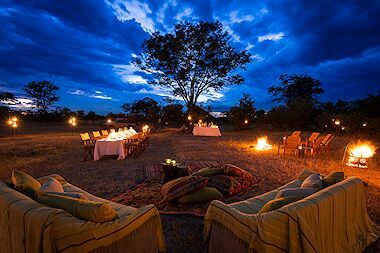 Dining on scrumptious snacks and drinks in the heart of a safari area is simultaneously thrilling and relaxing. 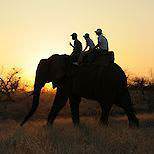 Educational and exciting elephant-back safaris are offered at several sanctuaries throughout South Africa. 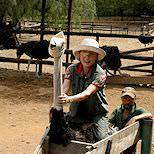 Oudtshoorn is known as the unofficial ostrich capital of the world. For a real thrill, opt to ride the largest bird. 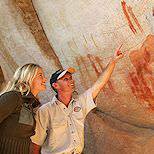 Southern Africa boasts many fascinating and well-preserved rock art sites, from Drakensberg to Cederberg. Prolong your pedestrian adventure in the bush by spending a few days hiking through the wilderness. 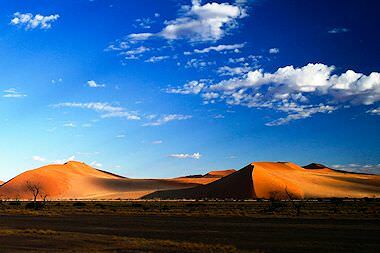 Explore the remarkable dunes of Sossusvlei in the Namib or the flat Makgadikgadi Pans via quad bike. 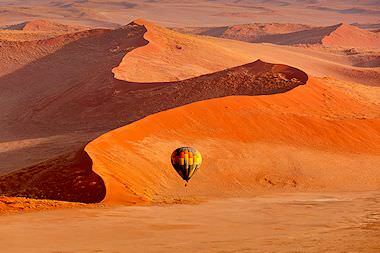 For the ultimate ‘alternative perspective’, endeavor a hot air balloon safari above Sossusvlei or South Luangwa. 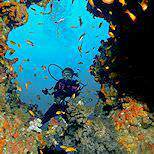 The Indian Ocean’s temperate waters offer some of the most pristine coral reefs in the world. Your African safari lodge will serve as the base from where you savor a range of safari experiences and inimitable game viewing. We've hand-picked choice properties in each wilderness from Sabi Sand to Sossusvlei. 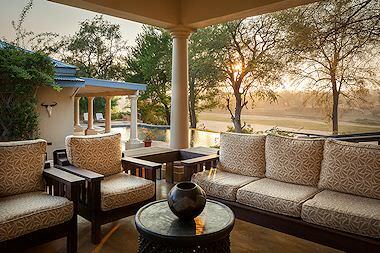 South Africa's fine infrastructure means that it is able to boast some of the most exclusive safari palaces imaginable. Plush four star options exist as well. 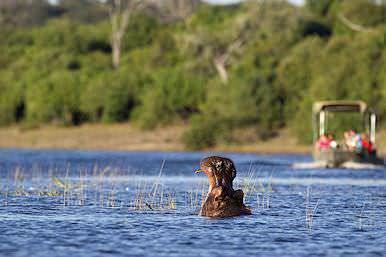 Botswana's lodges are largely eco-friendly outposts focused on minimizing their impact on the beautiful wilderness areas in which they are perched. Namibia's desert hideaways melt into the landscapes across which they are scattered, immersing guests in the almost overwhelming isolation. Zambia's safari lodges are as remote as they come. Startlingly, these far-flung accommodations are often remarkably sumptuous. Zimbabwe's accommodations range from lodges fit for royalty to comfortable safari camps for more budget-friendly travelers. Mozambique's safari lodges roost on private islets in pristine archipelagos. These accommodations are steeped in exclusive barefoot luxury.